Floods that affected nearly 500 properties in a Cumbria town had "overwhelmed" defences, a report said. A number of recommendations to prevent a repeat of the problems caused by Storm Desmond in Cockermouth last December, have been outlined. 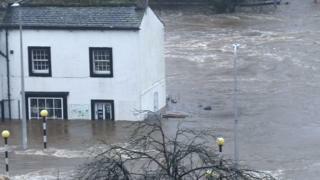 A total of 466 properties were flooded when water from the Cocker and Derwent rivers "overwhelmed" defences in a number of locations. The Environment Agency and Cumbria County Council drew up the report. Among its recommendations is a call to consider increasing the flow of water through Gote Bridge and identifying a way to trap debris upstream of the town to avoid causing a critical obstruction. Damage to the riverbank at Cockermouth Castle and fallen trees led to blockages at the bridge, the report stated. A review of the resilience of "critical" transport and power supply infrastructure, such as the way the Jennings Brewery substation was affected, is also to be undertaken. The report's findings will be discussed at a public meeting at the town's Christ Church on Monday. The flooding of 5 and 6 December, which saw "36 hours of intense rainfall", was the fourth time the town has been severely hit since 2005. The water level was recorded as 4.476m at the South Street footbridge. Improvements to defences in the south of the town following floods in 2009 lessened its impact, the report found. Separately, a review of the performance of the existing Cockermouth Flood Risk Management Scheme is under way and expected to be completed next month.